I'm thankful for the wild and crazy riders who emerge from every generation and do more than just push the boundaries: they completely and literally launch over and/or blow right through them. I'm thankful for the human spirit that yearns to fly higher, farther and faster. 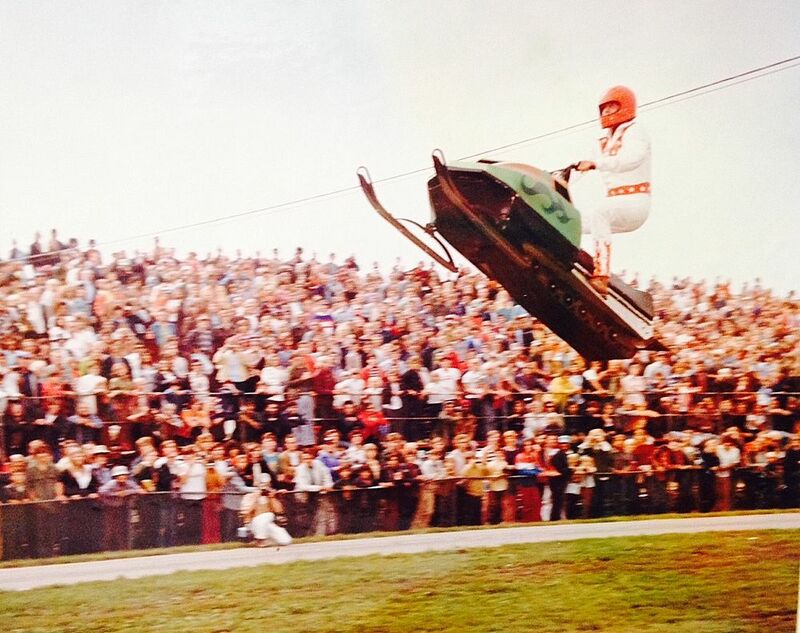 I'm thankful for Screamin' Scott Eilertson, Arctic Cat District Sales Manager, former racer and jumping record holder, who thrilled the 40,000 spectators at Great Lakes Raceway in Union Grove, Wis., on Labor Day weekend 1975 by launching his 1973 EXT 98 feet (and collapsing the running boards and spraining both ankles in the process). I'm thankful the power cable didn’t clothesline him. And I'm thankful it's Friday, Dec. 4, 2015 (and that Scott is STILL a wild/crazy Arctic Cat guy)! "Beam me up Scotty "
Dear oh dear. Very, very brave man right there. He had to of know with no doubt what's so ever that he and the sled would end up wounded ! Yikes ! ARCTIC Power!!!! The good ol` days!!!!! Scott, that looks like the Elvis suit we wore in Vegas a few years back. I must say, you look better in this picture than you did in Vegas. You are my hero!!!!!!!! Did he jump 98' to flat!? Landing on grass none the less? Dang! One of the most jovial Arctic enthusiasts. My Buddy and hero then. My buddy and hero now! Scott is my uncle, There's no one in the world with a bigger heart than him! Growing up with him and my other uncle jeff (his brother) was always fun. I know that Grandpa would be very proud of him. Alway's my hero,love ya uncle!